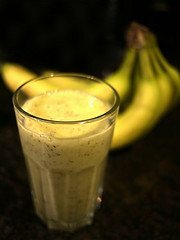 The Chunky Monkey is a pretty popular smoothie with many different recipe variations. Below you’ll find my preferred (healthy) version. As is the case with any smoothie recipe, feel free to play with the ingredients and proportions. A quick tip on using frozen bananas in your smoothie. Peel and break your bananas into smaller chunks, and then place those chunks into a big zip lock baggie before tossing into the freezer. I usually do this for 4 to 5 bananas at a time. Place all of the ingredients into your blender and blend on high for 30-45 seconds or until desired consistency is reached. I would love to know if you try this chocolate chunky monkey smoothie – please leave a comment below. Happy Blending!